The rabbit theme is still hoping around this blog. I made two rabbits popped up from the pea pods log. The rabbits were made of hand molded rice balls, dry yellow somen, nori, jelly balls, and white part of crab stick. Flowers were made of carrot and red part of crab stick. Filled the box with steam rice, strawberries, slice of lemon with chicken karaage, and veggie dumpling. I hope my kids won't ask me to buy rabbit as their pet after this. So far, none of their pets has lasted for more than 3 months. From fish (died), turtles (runaway), hamsters (get bored and gave them to a friend) ... So I don't think if we get any new pet will last long either. They asked me before for a puppy but I never said yes, so they get tired of asking. Perhaps later if they are bigger and are committed to take care the pet then I will say yes. Ya ampun..lucu bgttt.. pengen belajar bikin karakter yg lucu2 nih.. foto2nya boleh dijadiin sample buat belajar ga? :) thanks ya..
@mama elaine : Silahkan Yuli ... Happy to share. Thanks a lot for your kind comment! Your bentos always look fabulous! Love the carrot flowers! How did you make them? Ah.. I have the same problem as you, but with plants. Terrible, my plants always die, no matter how much I care about them! Anyways! Cute yellow bunnies! The flowers are so amazing! So beautiful! Tell me.. what "flavor" is the yellow somen? It is very interesting! @Jessica : Thanks a lot Jessica! I don't have the tutorial on how to make the carrot flowers on my blog. But you can hop to Megan's blog - Bento Zen to find the tutorial here. This is a lovely and healthy bento. The duo bunnies are real cute. I must start to make some bentos after CNY....hmmm...I hope so..hihii. 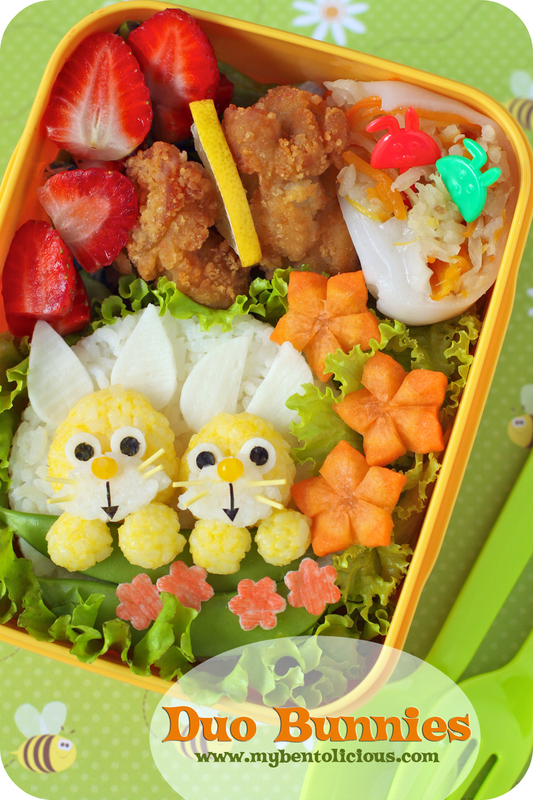 so cute bento lunch!! I love to make it!! @bento : Thanks a lot! Amazing attention to detail!! Wow, blown away again. I have yet to make something kawaii.... and you have had no trouble coming back to charaben! Now I can have your site to get ideas from, hehe! Happy New Year bunnies are cute! Yes, probably better to stick to pets in the bento box, no live ones. :) I really like the yellow and white rice combination for the bunnies. They look so happy! such adorable bunnies, like they are ready to hop out the box.. so real..haha..
Hope your kids will take that as their pets. yup.. looking after pet is a huge responsibility.. should wait till they are bigger, if not its us who take care of the pet..hehe..
and we cant just leave them when we are going off for vacation. thats the problem. @Amaaris : Hi Ama! Agree, rabbit is too cute too eat :) Never had rabbit as a pet when I was a kid, but one of my friend got 2 and I love to feed them. Thanks Ama for your comment!